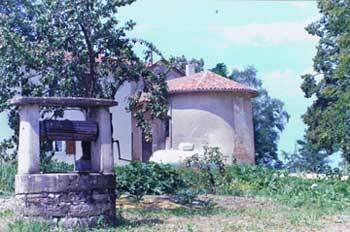 An old well still stands outside the tiny village church of Cuet in the south-east of France. Peter Chanel was baptised with water from a well like this at nearby Montrevel on July 16, 1803. Today the parish of Cuet simply and proudly remembers its Marist son who yearned so much to bring the living waters of baptism to the peoples of the Pacific. The parish priest today is a welcoming man, quietly aware of the unsought fame of young Peter and of the gentle initiative of his predecessor of 1812. In Autumn of 1812 the parish priest of the neighbouring village of Cras, the Abbe Trompier, had spoken to the lad about a priestly future in the footsteps of the Good Shepherd whom Peter already admired. Peter Chanel was a sturdy, cheerful nine year old, busy with the family work of leading their flock of sheep to pasture. After moving to live at Cras under the careful tutelage of Fr Trompier, the young Peter grew in devotion to the Blessed Virgin Mary, the Eucharist -- and the idea of a missionary life. In the small village little was heard of the echoes of war still rumbling around Europe as the broken remnants of Napoleon's `Grand Army' reeled back from Moscow — and other nations gathered their forces to crush the man before whom all Europe had trembled for so long. Soon there would be much re-building to be done, not only of the civil life of revolution and war-torn France but of its flock of faithful people too. So it was that Peter Chanel took the first step on a journey that would touch the lives of many along its way and end on a distant island paradise twelve thousand miles away. 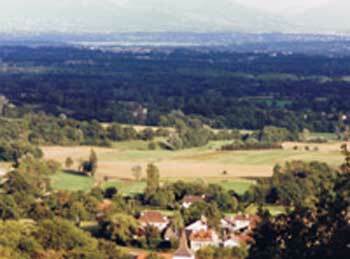 On Jul 15, 1827 Peter Chanel was ordained to the priesthood by Bishop Devie in the monastery church of Brou, Bourg-en-Bresse. 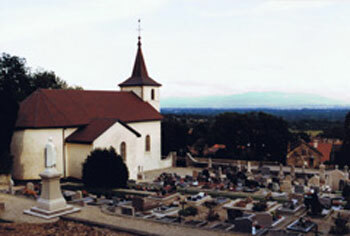 He became curate in the parish of Amberieu east of Lyon and soon afterwards was entrusted with the care of the remote parish of Crozet, high in the Jura mountains overlooking the border of Switerland. His new flock soon felt that sincerity and holiness by which they would remember him. Four years later Fr. Peter joined the infant Society of Mary, following one of two instincts which were to have great influence in his life: a deep love for Our Lady and a sense of being called to the foreign missions. As a Marist Father he was sent to the College of Belley, first as spiritual director, then as rector. 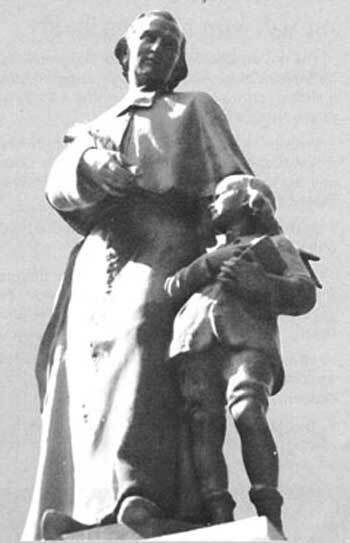 A statue of Fr. Peter and a young student stands in the grounds of that school today. It is a reminder of how the boys of the college felt the attraction of his goodness and gentle but powerful personality. In April 1836 Pope Gregory XVI entrusted the vast mission field of the south-west Pacific to the Society of Mary. Fr. Peter Chanel was amongst the first group to take religious vows a few months later. With six other Marists left the port of Le Havre for the far-flung world of Oceania. on the tide of Christmas Eve. The voyage was long and dangerous, round the Horn and westward across a mostly unchartered Pacific. Death by plague soon took the life of Fr Peter’s close friend, Fr Claude Bret. 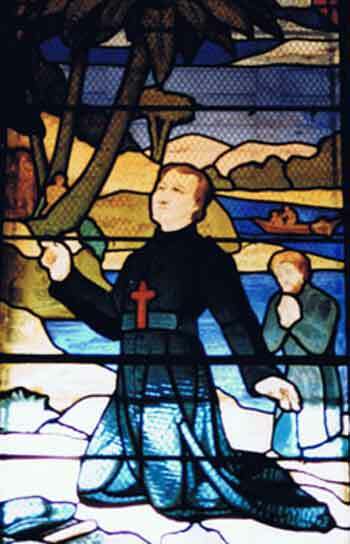 On November 08, 1837, almost a year after leaving his homeland and in the company of twenty-year-old Br Marie Nizier, Fr. Peter was left on the tiny dot is was the island of Futuna. Two simple stained windows in the church at Cuet depict the opening and closing chapters of Fr. 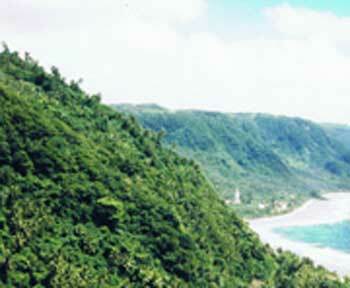 Peter's brief life among the people of Futuna. Peter Chanel was to work generously among the thousand inhabitants of Futuna for the next four years. The population had once been much greater but constant fighting and cannibalism had decimated their numbers. Indeed, not long before the arrival of Fr. Peter and Br. Marie Nizier, the native King Niuliki had been forced to outlaw cannibalism lest the natives eat themselves out of existence! The two missionaries were now completely cut off from the outside world. They set about building a shelter, growing food and learning a language utterly foreign to them. Progress in bringing the Good News of Christ to this unfriendly people was heartbreakingly slow - and the living water of baptism that Fr. Peter so longed to offer was hardly to be poured. 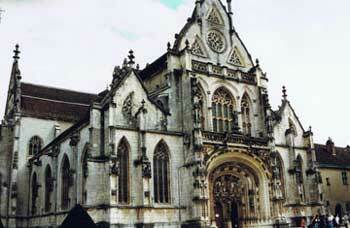 At the end of six months he had baptised only one Futunian — a dying child. 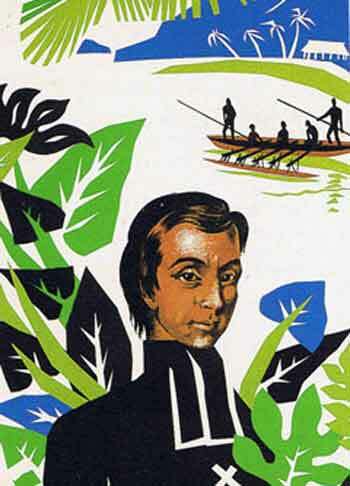 Peter Chanel's selflessness and love for this new flock began to have an effect on the natives. They gave him the name 'the man with the good heart'. All might have gone well had not the king turned against him and his call to the peace of the Gospel. The king determined to be rid of the missionaries and forbade anyone to give them food. He would starve them out. Fr. Peter and Br. Nizier's attempt to grow vegetables were frustrated by raids on their garden. At one time they were reduced to eating their dog. And then the king gave orders that the missionaries were to be murdered. 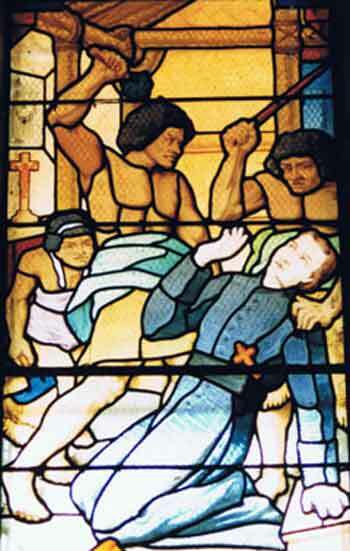 The second of Cuet's stained windows records the final chapter in Peter Chanel's life. Early in the morning of April 28, 1841, Fr. Peter was wakened from sleep and clubbed to death, his skull split by the axe of a Futunian warrior. He was thirty-eight years old. Oceania, with the Society of Mary, had its first martyr, who was to become one of Australia's patron saints. He was thirty-eight years old. Peter Chanel's story is a lesson in faith and generosity. 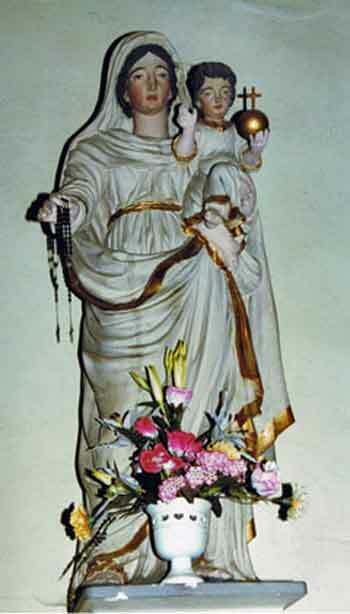 It is one of a human, lovable figure, blending the gentle availability of Mary with the manly strength of her Son. Only after his death did the true value of Peter Chanel's work appear. Within two years the Marist Fathers were again shepherding the flock of Futuna and in a short time the whole island became Christian, including the murderers of Fr. Peter. There is something peculiarly attractive about this 'man with the good heart'. Perhaps it is his simplicity — the simplicity of Mary and of her Society. St. Peter Chanel's strengths are the ones we sense are not beyond even us. 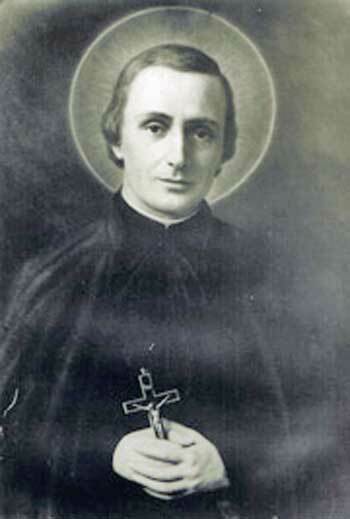 On June 12, 1954 Pope Pius XII declared St Peter Chanel SM to be a saint of the Church of God. We celebrate St Peter's feast day on Apr 28 each year. ... strengths not beyond even us. From left: 1. John Coburn painting, late 1960s. 2. 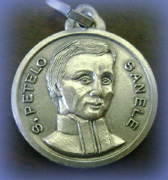 St Peter Chanel medallion. 3. Painting by Fr Carrigan MSC in the foyer of St Peter Chanel's church. Smithton, Tasmania. 4. Canonisation painting, 1954. 5. Sesquicentenary Icon painted by a woman of Bourg diocese , 1991.